Another of my forays into fantasy detective fiction, Into the Nightside combines a Deux-Ex-Machina magic system with style and flair compelling enough to drive the reader headlong through what remains of this trilogy. Make no mistake about it: Green's command of the language is equalled by very few. John Taylor is a detective - with a difference. In the Nightside, a world inside a world, where magic and machinery can stand side by side, a world where anything can be bought and sold, and nobody will bat an eyebrow, John Taylor can find anything. Sounds vaguely like a Deux Ex Machina device, doesn't it? And you'd be right. It is. But Green ameliorates this to the extreme - on John's trail, and able to sense the use of his gift, are the Harrowing (and believe me, they are: for the reader), Taylor's enemies for a reason that nobody knows. Or will tell him. ...But Taylor has left the Nightside, until a wealthy businesswoman calls at his London office with a problem. Her daughter has gone. And in his client's hand, the only clue she's got. And it reads NIGHTSIDE. Taylor's past will pull him back into the Nightside with a vengeance - and not all in this straightforward case is as it seems. 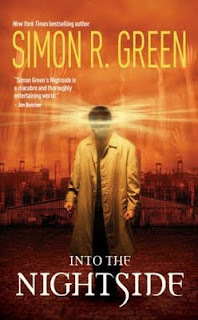 I would have enjoyed Into the Nightside for its purely stylistic merit, but Green takes it a step further: the world is entrancing (though has a slight problem with contrast - where everything is magical, powerful, and can cause inevitable cataclysm, nothing really remains to intrigue the reader by contrast). There's only one real flaw in Into the Nightside, and that is that the circumstances used to ameliorate Taylor's Deux-Ex-Machina-type ability on occasion seem just like that - used, and evidently so. But there's also plenty to like, with Green's well-developed characters, larger-that life (and well-so) world, and almost sympathetic, quasi-antihero that is John Taylor. It's well worth the read.